Peeled and Sliced Apples cooking in apple-juice. Perfect applesauce is not hard to make. Mine is sugar free as well. The apples are sweet enough, especially if you cook them in pure apple-juice (organic, unfiltered) or apple-cider (unsweetened). The thing is, like most of my recipes, time is the crucial ingredient. It takes a few hours, really to make applesauce, at least two. It’s a process. First you need to peel lots of apples, why bother making fresh applesauce if you are only making a little bit? It keeps for a while, you can give it away or you can preserve it. However you do it, it’s worth making a significant amount. I have an old fashioned apple-corer/peeler that is hand held. This makes my apple-peeling and coring much easier. But you still have to navigate the stray peels and parts that don’t come off. Or you can just peel by knife. I like to have help when I am doing this job, so it goes quicker, and also because having help in the kitchen is the way to go. 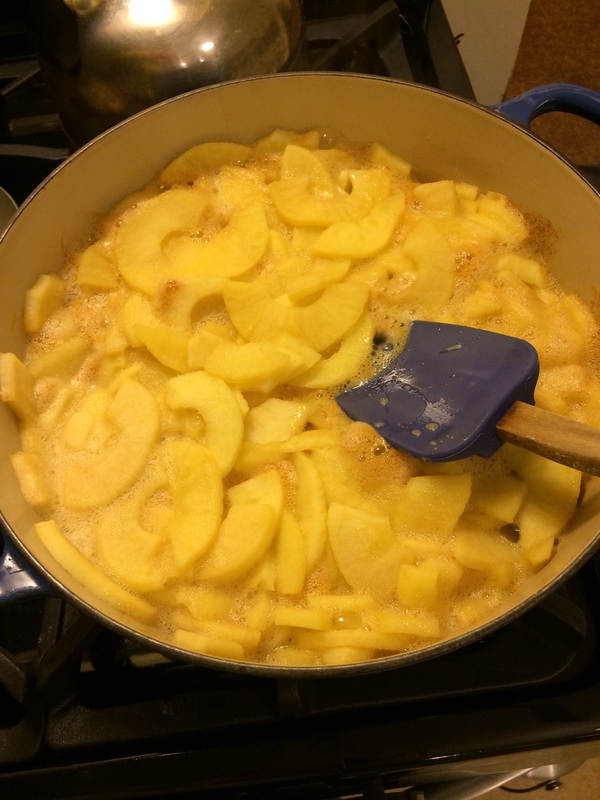 I put enough juice in the pot to almost cover the apples, a little less or more, won’t make a big difference. You do want enough liquid though. I cook on a medium-low heat, uncovered for a long time, stirring frequently until there are no recognizable apple pieces and it gets very broken down and looks like brown mush. It’s done then. I put a dash of salt, just a dash and sometimes add a 1/2 teaspoon of vanilla as well, (optional). Applesauce, of course, is the perfect complement to Latkes (potato pancakes) for Hanukkah. It’s best to make the applesauce a day or two ahead, because making and cooking the Latkes is time-consuming and messy (see my gluten-free Latke Recipe). You can enjoy applesauce all year round though. I don’t think using old apples is always the best. I use different apples based on who has dropped off a bag of them at my house, or what I find in the stores. This batch, photographed above, was made with Fuji apples, and it came out great. I’ve used “applesauce” apples, meaning they were the rejects or less than appealing looking apples. Using older apples often means you have to cut out a lot of bad parts. I am not a fan of using less than excellent ingredients in what I cook. You can make good applesauce with funky apples, but you can make great applesauce with good apples as well. That said, making applesauce with older apples is a good way to use an apple that is no longer appealing to eat fresh. I would prefer if you used an older apple in a crisp or something because the crisp has sugar and butter and oats also happening and the apple is part of the story, not the WHOLE story. Apples are the WHOLE story when you are making my applesauce. Please, do NOT add other things to my applesauce recipe, if you do, then it is no longer my version. Lots of people like combination applesauce versions; peach/apple, apple/cranberry, apple/pear etc.. I think those are fine, but this is not the recipe for those, since I’ve never made those. I am a purist in certain things. I guess applesauce is one of those things! Applesauce is also a really good first food to give someone after surgery, once they’ve been cleared for that kind of food, or for folks who are feeling under the weather. Serve it warm, not cold, it makes a person feel better. It is for sure a comfort food. See my Surgery Support: Pre and Post Lists for Optimal Recoveryand the other fabulous thing about making your own applesauce is how your home smells while it is cooking, Absolutely AMAZING!!!! !